Haydn’s first term of permanent employment lasted little more than a year. Count Morzin, who had appointed him as his Kapellmeister in 1759, soon ran into financial difficulties and had to dismiss his orchestra. Fortuitously, Prince Paul Anton Esterházy had attended one of the concerts at Morzin’s Bohemian summer castle in which Haydn is supposed to have conducted his Symphony No 1. He was impressed to the extent that when he heard of his redundancy he offered him the post of Deputy Kapellmeister at his own court at Eisenstadt in the Burgenland, south of Vienna. And so, with the contract that was signed on 1 May 1761, there began one of the most remarkable cases of musical patronage in the annals of music history, a tenure that lasted for almost exactly thirty years. At the beginning of his adult life, Paul Anton had taken up a military career, earning the rank of field-marshall for his leading of hussars in the wars of the 1740s. In the early 1750s he acted in a more diplomatic capacity as Austrian Minister Extraordinary to the Court of Naples, a posting that was to colour his musical tastes. He had always had a strong interest in music since his days of study with the Jesuits, and he was a competent player of several instruments. On his return to Austria he founded a small orchestra at his Eisenstadt palace. By the time of Haydn’s appointment, it had been expanded and could boast some of the leading virtuosi of the day among its number, including the violinist Luigi Tomasini as leader, and the cellist Joseph Weigl. As head of an orchestra I could experiment, observe what heightened the effect and what weakened it, and so could improve, expand, cut, take risks. I was cut off from the world, there was no one near me to torment me or make me doubt myself, and so I had to become original. Mention has already been made of the prince’s Italian tastes in music. Among the many volumes in his music library was Vivaldi’s famous set of four violin concertos Le Quattro Stagioni (‘The Four Seasons’) which made regular appearances in the orchestra’s concerts (or ‘academies’ as they were termed). It seems that the prince himself suggested to Haydn that he compose a similar set of works following the different times of day. Rather than concertos, Haydn chose the symphonic form, though one dominated by elements of the Baroque concerto and concerto grosso. The resulting three symphonies (Nos 6, 7 and 8 in the popularly accepted numbering but actually preceded by at least ten others from his days with Count Morzin) were the first works Haydn wrote in his new post. They were probably given their first performances in the great hall of the Esterházy’s Viennese palace (where the court spent most of the summer) in May or June 1761, less than a year before the prince died and was succeeded by his brother Nikolaus. 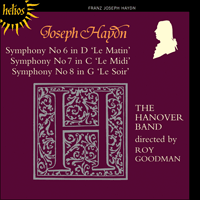 For his debut as court composer, Haydn seems to have had two purposes in mind when composing these symphonies—not a small degree of flattery to the prince’s interests in Italian music, and a chance to show off the new orchestra, and in particular the violin-playing of Tomasini. He did not follow Vivaldi’s example to the extent of following a detailed programme of extra-musical events, but Symphony No 6 does begin with a brief Adagio introduction that is undoubtedly meant to represent a sunrise (a foretaste, perhaps, of the similar passage in The Creation). The ensuing Allegro immediately introduces the flute and oboes as soloists, but the slow movement takes on the guise of a miniature concerto for the violinist Tomasini and cellist Weigl—a concertante group accompanied by a ripieno body of strings—a deliberate throwback to the Italian Baroque—even the ideas recall the musical gestures of Corelli. More unusually, the trio to the Minuet features a duet for violone (double bass) and bassoon. The finale returns to the concerto grosso layout with concertante violin and cello and features a virtuosic display for the former at its centre. Symphony No 7 again begins with a slow introduction and the concertante-ripieno concept is expanded to the typically Corellian trio of two violins and cello as soloists. For the second movement Haydn turns his attention to another area of Italian music—the operatic recitativo accompagnato, or accompanied recitative—a mode of setting dialogue in opera that Haydn himself was to use in his own operas and which remained popular until the time of Rossini. In the words of the Haydn scholar H C Robbins Landon, ‘the solo violin produces a realistic parody of the anguished dramatic soprano of Metastasian opera seria’, though what she might be singing about is left to our imagination. The slow movement proper introduces two flutes for the first time in the symphony (a touch Haydn often employed—saving a particular timbre later in a work for special effect), yet it is the cadenza for violin and cello that forms one of the work’s most remarkable passages. The violone (probably played by the bassoonist Georg Schwenda) again has a solo in the Minuet’s trio and the first movement’s instrumental disposition returns for the spirited finale. Of all the movements in these three symphonies, the ‘Allegro molto’ of No 8 is the least concerto-orientated. There are solo passages for the wind instruments, but no more than is usual in any of Haydn’s other symphonies. The slow movement, however, adds a bassoon to the trio concertante on No 7, providing the cello with a duet partner to match the two violins. The Minuet returns to the instrumentation of the first movement and (again) features a violone solo in the trio. The finale is the most overtly programmatic movement in any of the three symphonies. Cast in a strict ABA form, it is nonetheless a vivid musical evocation of a storm, with a solo cello (imitating the opening violin solo’s rapid semiquavers) suggesting a distant rumble of thunder, a falling arpeggio ‘raindrop’ (or perhaps ‘lightning’) figure on the flute, and passages of dramatic unisons portraying, maybe, torrents of driving rain. Le premier emploi permanent de Haydn ne dura guère plus d’un an. Le comte Morzin, qui en avait fait son maître de chapelle en 1759, subit bientôt des revers de fortune qui l’obligèrent à licencier son orchestre. Or il s’était trouvé que le prince Paul Anton Esterházy avait assisté à l’un des concerts donnés au palais d’été des Morzin, en Bohème, où Haydn aurait dirigé sa première symphonie. Il fut impressionné au point de lui offrir, en apprenant son licenciement, le poste de vice-maître de chapelle à sa résidence d’Eisenstadt dans le Burgenland au sud de Vienne. C’est ainsi que commença, avec le contrat signé le 1er mai 1761, l’un des plus remarquables exemples de mécénat des annales de l’histoire de la musique, qui allait durer presque exactement trente ans. Paul Anton avait fait dans sa jeunesse une carrière militaire, et avait été promu au grade de maréchal pour son commandement de hussards pendant les guerres des années 1740. Au début des années 1750, il agit en la qualité plus diplomatique de ministre extraordinaire d’Autriche auprès de la cour de Naples, poste qui allait influencer ses goûts musicaux. Il s’était toujours beaucoup intéressé à la musique depuis ses études chez les jésuites, et il jouait avec compétence de plusieurs instruments. A son retour en Autriche il fonda un petit orchestre à son palais d’Eisenstadt. A l’époque de la nomination de Haydn, cet orchestre s’était agrandi et comptait parmi ses membres les plus grands virtuoses de l’époque, en particulier le premier violoniste Luigi Tomasini, et le violoncelliste Joseph Weigl. A la tête d’un orchestre, je pouvais faire des expériences, j’étais libre de changer, d’améliorer, d’ajouter ou de supprimer, de me livrer à toutes les audaces. Coupé du monde, je n’avais personne pour m’importuner, et fus forcé de devenir original. On a parlé plus haut du goût du prince pour la musique italienne. Parmi les nombreux ouvrages de sa bibliothèque musicale se trouvait la célèbre série de quatre concertos pour violon de Vivaldi, Le Quattro Stagioni («Les Quatre Saisons») qui figuraient régulièrement au programme des concerts (ou «académies») de l’orchestre. Il semble que le prince lui-même ait suggéré à Haydn de composer une série analogue d’œuvres représentant les différentes parties de la journée. De préférence au concerto, Haydn choisit la forme symphonique, dominée cependant par des éléments du concerto et du concerto grosso baroques. Les trois symphonies résultantes (Nos 6, 7 et 8 dans la numérotation courante, mais précédées en fait d’une dizaine d’autres composées chez le comte Morzin) sont les premières œuvres que Haydn ait écrites dans son nouveau poste. Elles furent probablement joues pour la première fois dans la grande salle du palais viennois des Esterházy (où la cour passait la plus grande partie de l’été) en mai ou juin 1761, moins d’un an avant la mort du prince, auquel allait succéder son frère Nicolas. Pour ses débuts de compositeur de la cour, Haydn semble avoir eu deux desseins en composant ces symphonies: flatter, de façon non négligeable, l’intérêt du prince pour la musique italienne, et profiter de l’occasion pour mettre en valeur le nouvel orchestre, et en particulier le jeu du violoniste Tomasini. Il n’alla pas jusqu’à suivre, comme Vivaldi, un programme détaillé d’évènements extra-musicaux, mais la Symphonie No 6 commence par une brève introduction Adagio indubitablement conçue pour représenter un lever de soleil (un avant-goût, peut-être, du passage analogue de La Création). L’Allegro qui suit introduit immédiatement la flûte et les hautbois comme solistes, mais le mouvement lent prend la forme d’un concerto miniature pour le violoniste Tomasini et le violoncelliste Weigl, groupe concertant accompagné par un ripieno de cordes: il s’agit là d’un retour délibéré au baroque italien—même les idées rappellent le style de Corelli. De façon plus inhabituelle, le trio du Menuet offre un duo pour violone (contrebasse) et basson. Le finale revient au schéma du concerto grosso avec violon et violoncelle concertants, et a pour centre une démonstration de virtuosité pour le premier instrument. La Symphonie No 7 commence elle aussi par une introduction lente et l’idée concertante-ripieno est tendue au trio soliste typiquement corellien de deux violons et violoncelle. Pour le deuxième mouvement Haydn tourne son attention vers un autre domaine de la musique italienne, le recitativo accompagnato des dialogues d’opéra, que Haydn lui-même allait utiliser dans ses propres opéras et qui demeura populaire jusqu’à Rossini. Selon la phrase de H C Robbins Landon, le spécialiste de Haydn, «le violon soliste est une parodie réaliste de la soprano dramatique angoissée de l’opera seria métastasien», mais le sujet de son chant est laissé à notre imagination. Le mouvement lent proprement dit introduit pour la première fois deux flûtes dans la symphonie (cette façon de réserver pour plus d’effet un timbre particulier pour plus tard dans l’œuvre fut souvent employée par Haydn), mais c’est la cadence pour violon et violoncelle qui constitue l’un des passages les plus remarquables de l’œuvre. Le violone (probablement jou par le bassoniste Georg Schwenda) a à nouveau un solo dans le trio du Menuet et l’arrangement instrumental du premier mouvement est repris pour le finale plein d’entrain. De tous les mouvements de ces trois symphonies, l’«Allegro molto» de la Symphonie No 8 est le moins orienté vers le concerto. Il y a des solos pour les vents, mais pas plus que dans les autres symphonies de Haydn. Le mouvement lent, néanmoins, ajoute un basson au trio concertant de la Symphonie No 7, fournissant au violoncelle un partenaire pour rivaliser en duo avec les deux violons. Le Menuet revient à l’instrumentation du premier mouvement et un solo de violone figure (là aussi) dans le trio. De tous les mouvements de ces trois symphonies, le finale est celui qui suit le plus ouvertement un programme. De stricte forme ABA, c’est néanmoins la représentation musicale imagée d’une tempête: un violoncelle soliste (imitant les rapides doubles croches du solo de violon du début) évoque le grondement lointain du tonnerre, un motif d’arpège descendant à la flûte représente les gouttes de pluie (ou peut-être les éclairs), et des passages dramatiques à l’unisson décrivent, peut-être, des torrents de pluie diluvienne. Haydns erstes festes Dienstverhältnis währte kaum mehr als ein Jahr. Graf Morzin, der ihn 1759 zu seinem Kapellmeister ernannt hatte, geriet bald darauf in Finanzschwierigkeiten und mußte sein Orchester entlassen. Glücklicherweise hatte Fürst Paul Anton Esterházy ein Konzert in Morzins Sommerschloß in Böhmen besucht, bei dem Haydn, wie es heißt, seine 1. Sinfonie dirigierte. Esterházy war so beeindruckt, daß er Haydn, als er von dessen Entlassung hörte, den Posten des stellvertretenden Kapellmeisters an seinem Hof zu Eisenstadt im Burgenland südlich von Wien anbot. Und so begann mit dem Vertrag, der am 1. Mai 1761 unterzeichnet wurde, einer der bemerkenswertesten Fälle musikalischer Gönnerschaft in den Annalen der Musikgeschichte, ein Dienstverhältnis, das fast auf den Tag genau 30 Jahre andauerte. Als junger Mann hatte Fürst Paul Anton die Militärlaufbahn eingeschlagen und sich als Befehlshaber der Husaren in den Schlachten der 40er Jahre des 18. Jahrhunderts den Rang eines Feldmarschalls erworben. Anfang der 50er Jahre wandte er sich der Diplomatie zu und war als außerordentlicher Gesandter österreichs am neapolitanischen Hof tätig, eine Stellung, die seine musikalischen Vorlieben beeinflussen sollte. Er hatte sich seit seiner Studienzeit bei den Jesuiten stark für Musik interessiert und verstand mehrere Instrumente kompetent zu spielen. Bei seiner Rückkehr nach österreich führte er an seinem Schloß in Eisenstadt ein kleines Orchester ein. Als Haydn dazustieß, war es bereits erweitert worden und konnte sich einiger der führenden Virtuosen jener Zeit rühmen, darunter auch der Violinist Luigi Tomasini als Konzertmeister und der Cellist Joseph Weigl. Ich konnte als Chef eines Orchesters Versuche machen, beobachten, was den Eindruck hervorbringt und was ihn schwächt, also verbessern, zusetzen, wegschneiden, wagen; ich war von der Welt abgesondert. Niemand in meiner Nähe konnte mich an mir selbst irremachen und quälen, und so mußte ich original werden. Der italienisch beeinflußte Musikgeschmack des Fürsten wurde bereits erwähnt. In seiner reichhaltigen Musikbibliothek war unter anderem Vivaldis berühmte Serie von vier Violinkonzerten mit dem Titel Le Quattro Stagioni („Die vier Jahreszeiten“) zu finden, die regelmäßig in den Konzerten des Orchesters (den „Akademien“, wie sie damals bezeichnet wurden) erschienen. Es war offenbar der Fürst selbst, der Haydn vorschlug, mit einer ähnlichen Serie von Werken die verschiedenen Tageszeiten abzuhandeln. Anstelle des Konzerts wählte Haydn als Form die Sinfonie, wenn auch beherrscht von Elementen des Barockkonzerts und des Concerto grosso. Die resultierenden drei Sinfonien (Nr. 6, 7 und 8 nach geltender Zählung; in Wahrheit gehen ihnen mindestens zehn andere aus der Zeit beim Grafen Morzin voraus) waren die ersten Werke, die Haydn in seiner neuen Funktion schrieb. Sie wurden vermutlich im großen Saal des Wiener Schlosses derer von Esterházy (wo der Hof den überwiegenden Teil des Sommers verbrachte) im Mai oder Juni 1761 uraufgeführt, weniger als ein Jahr, bevor der Fürst starb und sein Bruder Nikolaus die Nachfolge antrat. Für sein Debüt als Hofkomponist scheint sich Haydn zweierlei vorgenommen zu haben, als er diese Sinfonien schrieb—dem Interesse des Fürsten für italienische Musik nicht unerheblich zu schmeicheln und das neue Orchester vorteilhaft zur Geltung zu bringen, inbesondere Tomasinis Violinspiel. Haydn hielt sich insofern nicht an Vivaldis Vorbild, als er keinem detaillierten Programm außermusikalischer Ereignisse folgte, aber die Nr. 6 beginnt immerhin mit einer kurzen Adagio-Introduktion, die zweifellos den Sonnenaufgang darstellen soll (Vorgeschmack vielleicht auf die ähnliche Passage der Schöpfung). Das anschließende Allegro führt sogleich Flöte und Oboen als Soloinstrumente ein, während der langsame Satz in Gestalt eines Miniaturkonzerts für den Violinisten Tomasini und den Cellisten Weigl daherkommt—eine Concertino-Gruppe, die von einem Streicher-Ripieno begleitet wird. Dies ist ein bewußter Rückgriff auf das italienische Barock—selbst die Motive erinnern an die musikalischen Gesten Corellis. Noch ungewöhnlicher ist das Duett für Violone (Kontrabaß) und Fagott, das im Trio des Menuetts vorkommt. Das Finale kehrt mit konzertierenden Violine und Cello zur Struktur des Concerto grosso zurück und zeichnet sich im Mittelteil durch eine virtuose Violinpassage aus. Die Sinfonie Nr. 7 beginnt wiederum mit einer langsamen Introduktion, und das Konzept Concertino-Ripieno wird auf das für Corelli typische solistische Trio von zwei Violinen und Cello ausgedehnt. Beim zweiten Satz wendet Haydn seine Aufmerksamkeit einem weiteren Gebiet der italienischen Musik zu, dem Recitativo accompagnato, also dem instrumental begleiteten Rezitativ—einem in der Oper gebräuchlichen Vertonungsverfahren, das Haydn selbst in seinen Opern anwandte und das bis in Rossinis Zeiten populär blieb. Um es mit den Worten des Haydn-Forschers H C Robbins Landon zu sagen: „Die Solovioline bringt eine realistische Parodie auf den leidvoll beseelten dramatischen Sopran der Opera seria im Stile Metastasios hervor“. Doch wovon sie singt, bleibt unserer Fantasie überlassen. Der eigentliche langsame Satz führt zum ersten Mal in der Sinfonie zwei Flöten ein (eine Besonderheit, von der Haydn des öfteren Gebrauch machte—nämlich ein bestimmtes Timbre in einem Werk als Spezialeffekt für später aufzuheben). Doch ist es die Kadenz für Violine und Cello, die eine der bemerkenswertesten Passagen des Werks darstellt. Der Violone (vermutlich von dem Fagottisten Georg Schwenda gespielt) erhält wiederum ein Solo im Trio des Menuetts, und die instrumentale Besetzung des ersten Satzes findet sich für das beherzte Finale erneut zusammen. Von allen Sätzen dieser drei Sinfonien ist das „Allegro molto“ der Nr. 8 am wenigsten am Instrumentalkonzert orientiert. Es enthält Solopassagen für die Bläser, jedoch nicht mehr, als in Haydns anderen Sinfonien üblich sind. Der langsame Satz dagegen fügt dem Trio concertante der Nr. 7 ein Fagott hinzu, wodurch das Cello einen Duettpartner erhält, um es mit den zwei Violinen aufzunehmen. Das Menuett nimmt die Instrumentierung des ersten Satzes wieder auf und sieht im Trio (erneut) ein Violone-Solo vor. Das Finale ist der am offenkundigsten programmatische Satz in allen drei Sinfonien. In strenger A-B-A-Form angelegt, ist er eine anschauliche musikalische Darstellung eines Gewitters, wobei ein solistisches Cello (das die schnellen Sechzehntel des einleitenden Violinsolos imitiert) fernes Donnergrollen suggeriert, die Flöte mit einer abwärts gerichteten Arpeggiofiguration „Regentropfen“ (bzw. „Blitze“), und mehrere dramatische Unisonopassagen sollen möglicherweise strömenden Regen darstellen.